While the architecture and decor of the houses I will be featuring may vary, what they all have in common is an interesting story to share because it is the story of the people who call it home. This lovely Greek Revival is the home of Joe and Jan. It was built in 1925 and they have lived here for 40 years. It is right next door to the home I featured in Part 2 of this series. This massive solid wooden door sets the stage for what greets guests inside. 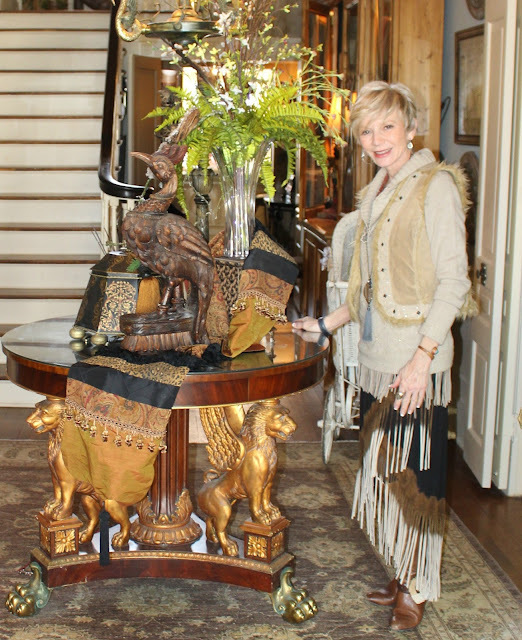 Jan describes her decorating style as eclectic with a heavy influence of Neoclassical. 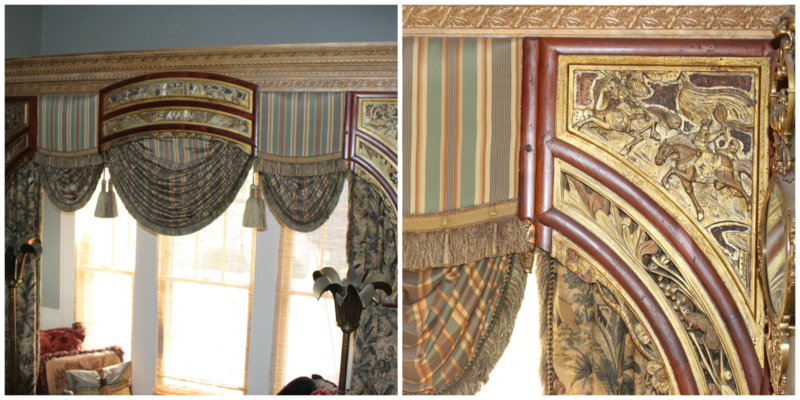 Neoclassical design is characterized by grandeur of scale. There are no pastels or froufrou, but lots of Greco-Roman. Neoclassical gets its prestige from Napoleon and his passion for all things martial, mythic, and imperial—the spoils of conquest. 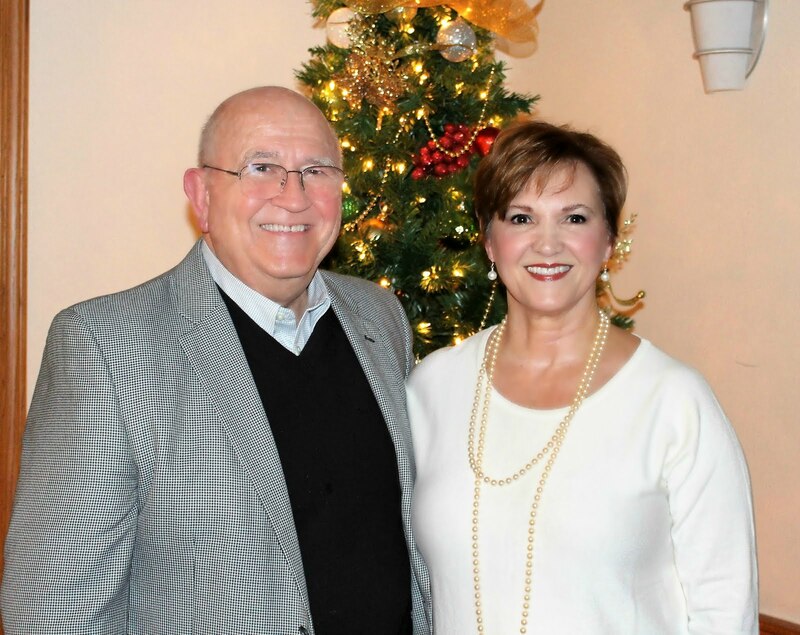 Joe and Jan have owned and operated an antique store and boutique for over 35 years here in Shreveport, known as Hudson House Interiors. Because of their business, they have traveled extensively in search of beautiful pieces of furniture and accessories. Their comfortable home is a showcase for many of their favorite finds. This magnificent mantel was found on their very first trip to England many years ago. This gorgeous baby grand piano is truly a classic. There is absolutely no conflict in this house between two distinctly different periods - Greco-Roman and an antique Victorian Rose Back child's rocker. Joe told me that this is the oldest piece of furniture in the house. It is an English Secretary dating back to the 18th Century. Such character. The Neoclassical theme is exemplified in this large painting. Jan is always moving things around and finding new homes for favorite items. For instance, not long ago, this painting was hanging in another room, but it couldn't be more perfect here in the living room unifying the small desk and leather settee. 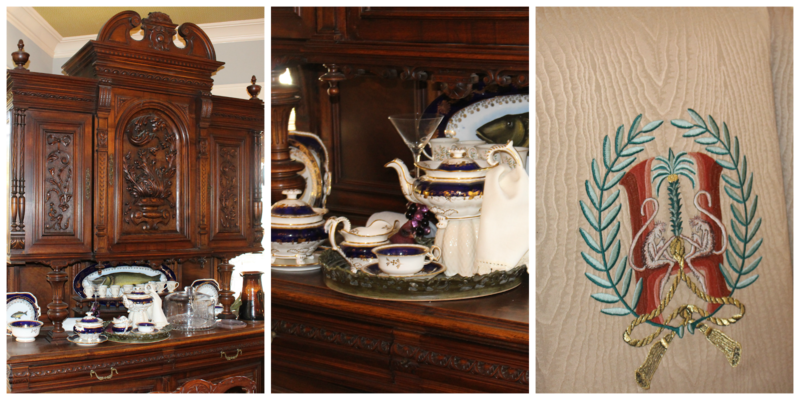 Perhaps one of the last things one would expect to find in this room is an art deco carving. But, Jan says she loves this piece and wants it where she can enjoy it. I think this philosophy is what makes one truly love their home. The adjoining dining room overlooks the outdoor sunroom and pool area, which provides plenty of natural light. It is such a lovely space for entertaining. This massive, intricately designed hutch is truly the focal point of the room. The china and napkins on the beveled glass dining table replicate the colors in the embroidered crest on the silk wing back captains chairs. Other pieces of art deco influence are the large round mirror and lamps in the dining room. The rare burl wood chest holds beautiful pieces of cut glass. Across the spacious foyer from the living room is the office. The first thing one notices in this sophisticated, masculine room is the intriguing light fixture over the antique desk. 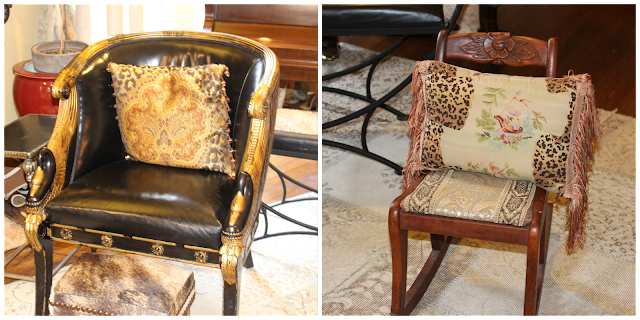 This inviting leopard print chaise adds a touch of femininity and a great place to relax and read. In an opposite corner is an antique bar with beautiful wood overlay designs. In the foyer is a massive piece that Joe explained they had specifically designed and made by an English artisan for this very place in their home. Even the tiny powder room nestled under the staircase defines the homeowners decorating style. Perhaps the room that best reflects Jan's vivacious spirit is the kitchen and light-filled breakfast room. She was having a jewelry showing of new pieces just received from Turkey on this day. And yes, I took some pieces home with me. The unusual hanging pot rack/light fixture brings so much character to this kitchen. Did you know you could keep a topiary in a large urn on your cutting block island? In this home, one would expect nothing else. I think the thing I noticed first upon entering this home was the staircase lined with family portraits. It beckons one to explore where it might lead. On the landing, is an amazing window seat overlooking the back pool and gardens. Jan explained that she had tried for years to find the just-right window treatment and could never find anything that satisfied her. 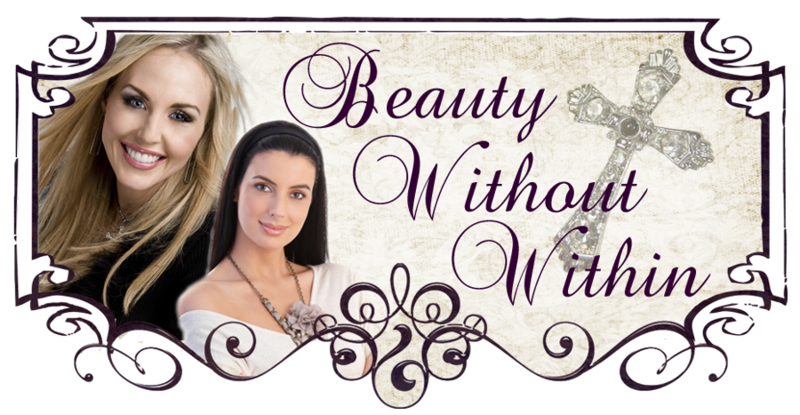 That is, until on one of their trips abroad, she located the carved and hand painted wooden header that was exactly what she had envisioned. She had the fabric inserts and drapes made to complete the unit. It is impossible to imagine anything more perfect to set off this special place. It was like finding Cinderella's slipper: The fit was perfect. The second floor contains the bedrooms. But one cannot go up the stairs without spending time to look at this stunning light fixture. The bookshelves on the top landing further define this transitional space. The master suite continues the neoclassical style with the columned-post king-size bed. The mirrored night stands add a bit of whimsy to this dignified yet inviting retreat. 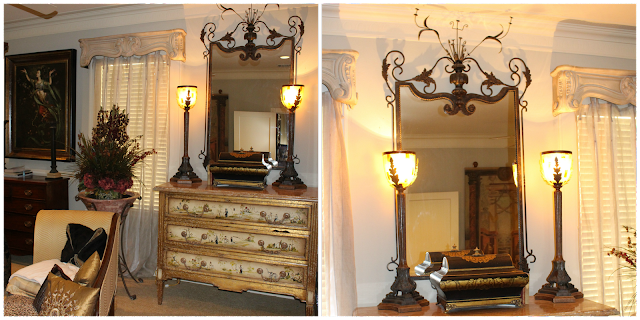 This room also reflects Jan's eclectic taste with the addition of the heavy brocaded, oriental pattern bed cover and pillows, as well as this beautiful Chinese chest. One of my favorite items? This delicate medal mirror. 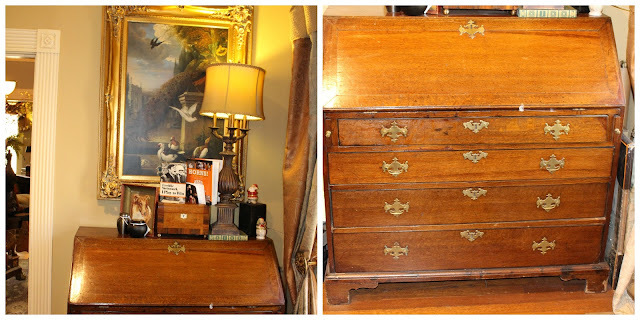 Perhaps Jan's favorite piece is this enormous mahogany chiffarobe that she found in Europe. It comes in three pieces and not only adds much needed storage space but also balances the large pieces on the opposite wall. 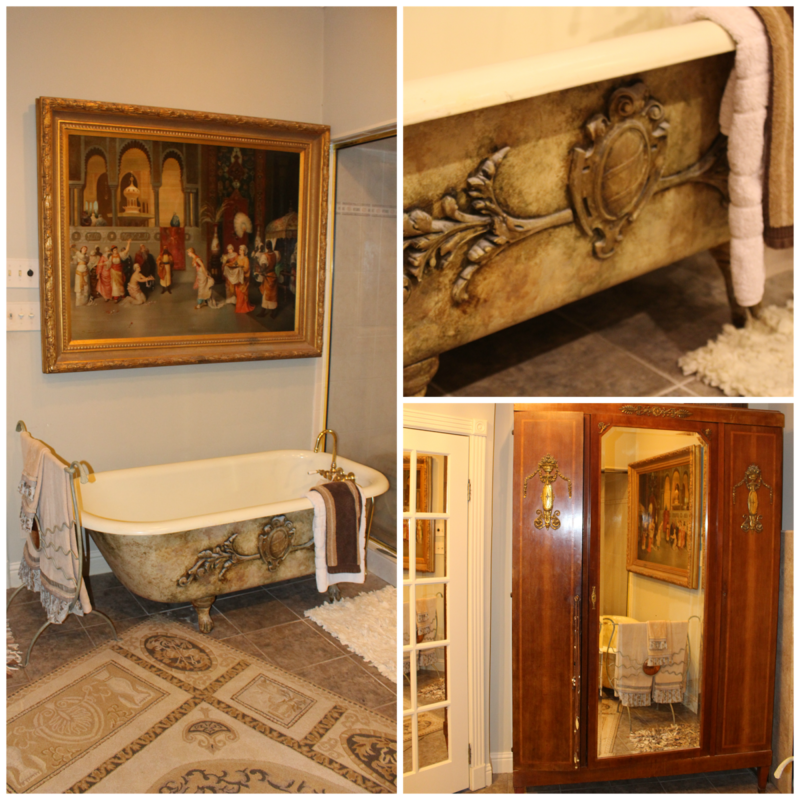 The master bath and adjoining work-out room were renovations the homeowners made to the house. They also had the old clawfoot tub refurbished with added detail. 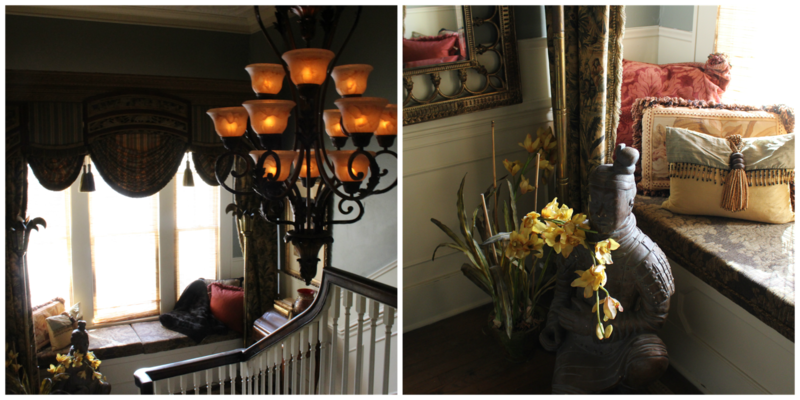 The concept of house as sanctuary is one of the great cliches of interior design writers. And yet, it is more than a cliche in this house made home by two people who have a distinct style. Jan told me the first time she stepped into this house 40 years ago, she knew it was to be hers. And hers it has become as she has continued to mesh their personality, experiences, and family into a true sanctuary just for them. Perhaps the best example that styles can mix to express what is important to you, is this child's wicker buggy holding a painting done by a neighbor at the birth of their granddaughter a few months ago. There is an interesting story behind it. There had not been a girl born into Joe's side of the family for almost 100 years. But one day last year grandson Harrison announced that Jesus had told him that the baby they were expecting was a girl and her name was Ella. Sure enough, she was and she is! 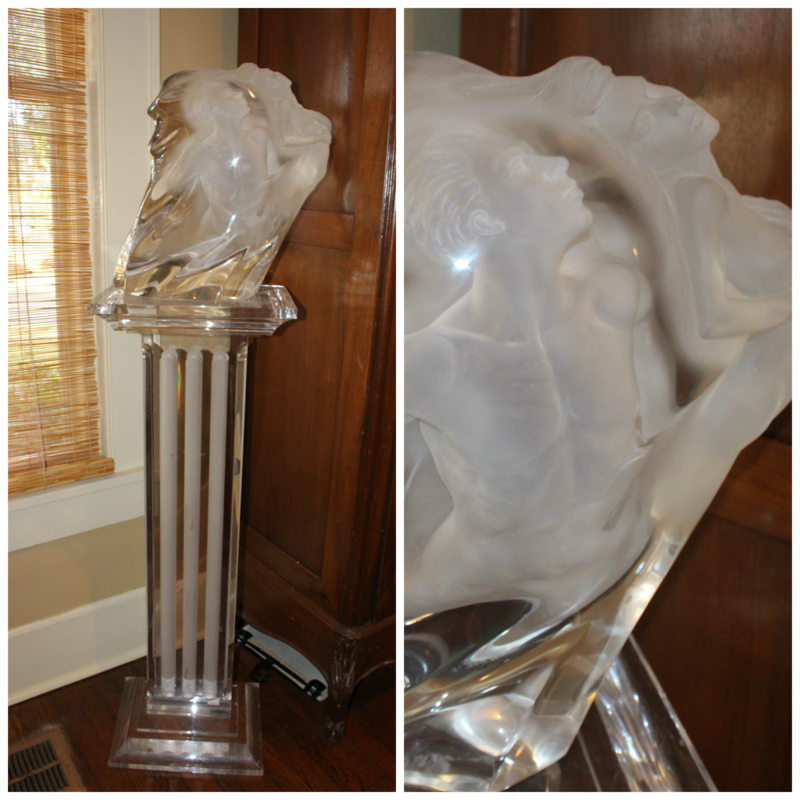 Thank you so much, Joe and Jan for sharing your wonderful neoclassical home with us. You are a delight. 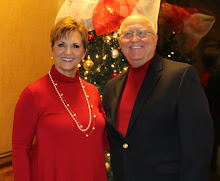 Stay tuned for future blogs about fashion that Jan and I will be doing. Can't wait! Good morning! My goodness, what an absolutely beautiful home! Soo interesting to see how different people are and the styles and choices they use when decorating their homes. This one, while truly stunning, is definitely NOT things I would pick out or use, but come together sooo well to reflect their personal style. I thoroughly enjoyed this tour. How fun this must be for you to see all of these homes in person. Enjoy your day! Jan is one of those top shelf girls - a good business woman, designer, and fashion guru. I have so enjoyed watching her create beautiful displays at Boutique des Noel over the years. Thanks for a glimpse into her treasures! Wow! This is so dramatic! Thank you so much for the tour! Wow! Such a beautiful home...loved the tour. I loved the tour...so many unique touches. Thanks for adding your flair to the Thursday Favorite Things Blog Hop! This post has been pinned to our group board.